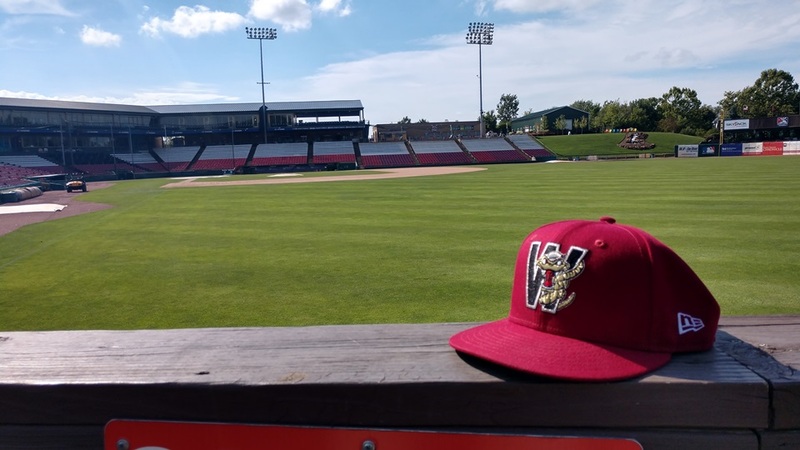 GENEVA, IL - The Wisconsin Timber Rattlers playoff chase came to an end on Sunday night with a 2-1 loss in ten innings to the Kane County Cougars at Northwestern Medicine Field. Tim Susnara drew a bases-loaded walk with two outs in to drive in the winning run for the Cougars. The game nearly started with a bang for Wisconsin (67-71 overall, 36-32 second half). David Fry, Milwaukee's 7th round pick in the 2018 draft, stepped to the plate with one on and two out in the top of the first inning for his first plate appearance as a Rattler. Fry cracked a high, towering drive to left that carried to the wall where Ryan Grotjohn made a leaping grab to take a homer away from Fry. Jay Feliciano gave the Rattlers a 1-0 lead with a home run to left that Grotjohn could only watch fly over the wall. Feliciano's blast was his fourth of the season and came with one out in the third. The Cougars (72-65, 37-31) tied the game without the benefit of a hit in the bottom of the third. Rattlers starting pitcher Wilfred Salaman walked Tra Holmes and Jose Caballero to start the inning. The duo pulled off a double steal with one out. Holmes would score on a two-out wild pitch by Salaman to even the score. The score stayed 1-1 thanks to some great pitching by both sides as neither team had a runner make it past second base from the fourth inning through the ninth. Kane County starter Mack Lemieux struck out nine Rattlers over 5-1/3 innings. Tyler Keele worked 2-1/3 scoreless frames. Kyler Stout entered the game when the Rattlers had runners at first and second with two outs in the eighth to get the final out of that inning. Stout retired all six batters he faced in the eighth and ninth innings. Salaman worked around a lead-off single in the fourth to keep the game tied. Matt Hardy tossed a scoreless fifth, but gave up a lead-off double in the sixth. He would strike out the next two batters before giving way to Clayton Andrews. Andrews walked the first batter he faced, but struck out Ramos for the final out in the sixth. Then, Andrews tossed a scoreless seventh, eighth, and ninth. He would go back out for the bottom of the tenth with pinch-runner Ryan Dobson representing the winning run starting the inning at second base. Holmes bunted Dobson to third and that was all for Andrews, who struck out six in his 3-2/3 innings. Wisconsin got creative with Christian Meister coming in from the bullpen in relief of Andrews and the winning run at third with one out and the top of the Kane County order coming to the plate. Manager Matt Erickson brought Chad McClanahan from left field to play first base and moved Gabriel García to the left side of the diamond for a five-man infield. Caballero worked the count full before sending a grounder to the right side of the infield. McClanahan made a play for the ball, but the ball went to second baseman Seferina. This left McClanahan out of position. Seferina looked the runner back to third as he raced to first and beat Caballero with a feet-first slide into the base. The Rattlers elected to walk Yoel Yanqui intentionally, because Yanqui is - including Sunday night - 25-for-74 against Wisconsin pitching this season. Meister got ahead of Jancarlos Cintron with two quick strikes, but Cintron worked the count full and drew a walk on the ninth pitch of the at bat to load the bases and bring Tim Susnara to the plate. Susnara was down in the count 1-2 after three pitches, but the next three pitches from Meister missed the strike zone and the bases-loaded walk allowed Dobson to score the winning run and end Wisconsin's playoff chances. In the second half Western Division Wild Card race, the Beloit Snappers kept their season alive by beating the Cedar Rapids Kernels 9-4 at Pohlman Field on Sunday. The Snappers are now 36-32. Kane County is 37-32. The Cougars will be the Wild Card if they win or Beloit loses on Monday. The Snappers will be the Wild Card if they win and the Rattlers beat the Cougars on Monday. The team that claims the second half Wester Division Wild Card will host Cedar Rapids in Game One of a First Round Playoff series on Wednesday night. The final game of the regular season is set of Monday afternoon. Dylan File (7-10, 4.11) is the scheduled starting pitcher for the Timber Rattlers. Kane County has named Lane Ratliff (7-1, 2.51) as their starter. Game time is 1:00pm. The radio broadcast is on AM1280, WNAM starting with the Potawatomi Hotel & Casino Pregame Show at 6:10pm. The broadcast is also available on the Tune In and IHeart Radio apps. Subscribers to MiLB.tv can watch the game over the internet.